I am extremely excited to share my "Waiting for Wednesday" selection with you. That's exactly how I feel about McCammon's Boy's Life . I beg you - right now - read it. I've bought every used copy of Boy's Life I've come across just so I could give it to people. 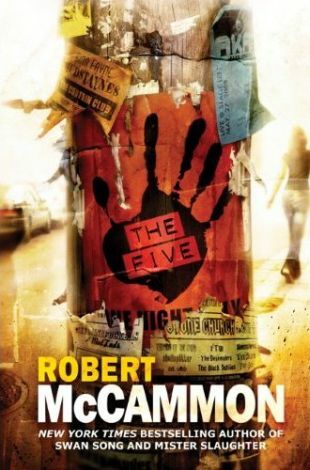 McCammon is an extraordinary writer, and I'm looking forward to (waiting for!) The Five! I've not heard of this book before, but it sounds really interesting! Thanks for sharing! I only reccomend 2 books, One is anything written by Emmet Fox, the other is "Swan Song". By far the best book I ever read, and I have gone back and read all 900+ pages at least 6 times. I had not idea he had come out of retirement-going to book store asap. I've always said the man could write a 500 pg. book about a big grey rock, and you'de be engrossed. One suggestion, if you haven't read "The Stand" by Stephen King yet, have it ready, it's the only book that "brought me down" after finishing Swan Song, not other book compared. ENJOY the rollar coaster ride. Check out "Blue World if you can find it.